While the HomePod provides room-filling sound and Siri-powered smart features, there are alternatives that could provide similar features while maintaining the audio. One option is the Fluance Fi70, a Bluetooth-enabled speaker boasting power and quality that the HomePod simply cannot match. Ever since Apple announced the HomePod, I've been intrigued with the thought of having a smart speaker that can assist me throughout the day. One that can handle tasks like answering questions, setting reminders, and controlling smart devices just like my Amazon Echo, but with better integration with my other Apple products, while at the same time offering improved sound quality that lets you enjoy your music instead of just filling the silence. Unfortunately, after more than 6 months with the HomePod, the device and its spotty Siri integration misses the mark for me. 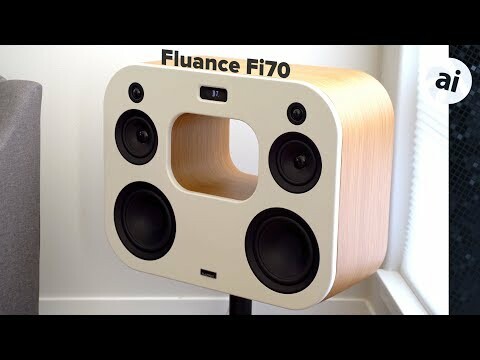 The Fluance Fi70 on the other hand, while not perfect, does a better overall job while providing more powerful, high fidelity sound. The Fluance Fi70's footprint is massive compared to HomePod, and the weight difference is even greater at 81 pounds compared to the relatively lightweight 5.5 pounds. While not as simple and elegant, the Fi70 looks like an art piece displayed on its included stand, and with the magnetic cover removed shows off its dual 1-inch silk tweeters, 6.5-inch speakers, and 8-inch woofers, all powered by a 280-watt amplifier. On the back, we have an antenna for the built-in radio, USB for charging, optical input, and a 3.5mm input which can be used to squeeze out higher quality Chromecast audio sound than data transferred via Bluetooth. The HomePod, on the other hand, features 7 tweeters and a 4" subwoofer, each powered by their own amps, and no physical input or Bluetooth support, just AirPlay 2. In terms of sound quality, HomePod beat out each one of its direct competitors, and I have to admit at low volumes it does sound better than the Fluance. Apple did an amazing job developing this speaker's hardware and getting it to sound great with all genres of music. The only audio complaint I have is it doesn't get that loud especially for large rooms, and the deep satisfying bass that you get at low volumes quickly fades away when set to its maximum. The HomePods at its highest volume out sound like the Fi70 at 60%, and at full blast the Fluance sounds more than twice as loud as HomePod. The difference in bass is shocking, as you can only hear the HomePod's bass but with the Fluance you feel it in the floor, the furniture, and even in your guts. You can literally have a full-on dance party with the Fi70, shake your walls, and really annoy your neighbors. Thankfully I live at the quiet end of a street. Apple offers a solution to help those who want more volume and bass in the form of a second HomePod, which does help a lot but costs a total of $700. What's more, a pair of HomePods still can't compete with the Fluance, which is cheaper at $500, not including the $40 to $100 it costs to add on an Echo or Google Home. Before the Fi70, I was mostly happy with the output of the stereo paired HomePods, but after months of frustration with Siri, I couldn't help but think if the money would be better spent on a higher end speaker that could somehow pair with my Echo. Most would agree that Siri is behind many of its competitors, and the version that ships with HomePod is even more limited. Even more frustrating is that the HomePod takes over any "Hey Siri" request within range, and the response often results in "I can't get the request on HomePod". This makes having "Hey Siri" support on my iPhone, iPad, and Mac worthless. The HomePod's mic is so sensitive, as it picks up my normal speaking voice around two corners and halls in my bedroom. I now manually enable Siri on my devices instead of using my voice to avoid triggering Siri on HomePod. We were hoping to see some improvements to HomePod's software at WWDC, and even made a list of our most requested features, but unfortunately nothing happened. On top of that, there are many more devices that support Amazon's Alexa assistant, and a few of mine aren't compatible with HomeKit, so I need to keep my phone close to toggle those using their apps. This isn't always possible, especially when cooking. It was refreshing experiencing a higher level of intelligence after switching back to the Echo, and the more-open ecosystem allows integration with a variety of audio services, not just Apple Music. The Echo also easily connects to any Bluetooth speaker for audio output, like the Fluance Fi70. The result is a surprisingly good combination that I'm very happy with, but with a few limitations. The Fluance F7i will shut down if it's not used for awhile, which requires turning it on using the touch controls on top or the remote, then asking Alexa to reconnect. The second annoyance is the Echo can't control speaker volume, like it can with my old LG Bluetooth enabled sound bar. To get around this hurdle, I keep the Fluance at its max setting of 40 and adjust Alexa's output, but every once in a while I'll accidentally play something when both are maxed out, and scare my family and myself. The last downside is no Alexa voice support for Apple Music, but it should be noted that HomePod has the same issue with other services, so it really depends on what service you use to stream. I'm still using Apple Music with the Fluance, but connecting directly to the speaker using Bluetooth and then using the app or Hey Siri to control the tunes. So after about a month, I'm very happy with my slightly inconvenient but great sounding, much more capable, and extremely loud HomePod replacement that costs less money. If you're someone who is a casual listener at normal volume levels and don't heavily rely on voice control, especially if you're an Apple Music subscriber, a single HomePod may still be the better choice. For me, someone who loves loud high-quality music and the convenience of a good smart assistant, the choice is an easy one. The Fluance Fi70 Three-Way Wireless High Fidelity Music System, which retails for $499.99, is available in three colors: Black Ash, Lucky Bamboo and Natural Walnut. Fluance Audio with Amazon has each finish in stock with free shipping. That thing looks ridiculous without the grill; the word monstrosity comes to mind. It’s looks somewhat better with the grill in place, but it’s still very large. Sure don't want one of those on the vanity in the master bath. Also don't want to have to bring my phone into the room to use bluetooth. I will stick with real speakers for the family room and HomePods in places that make sense. You’re kidding, right? The whole point of the HomePod is good quality sound at a reasonable price that doesn’t impact your personal privacy. Yup, I can just see the massive Fluance speaker sitting on a kitchen counter. And if you need to ask Siri for something, you can just pull out your iPhone (as long as you have it with you). Better idea: instead of comparing the Fluance to the HomePod, compare it to a high end amplifier/receiver with a 7.1 Dolby surround speaker system. That comparison would make more sense. This is not at all the same product category and this review is insulting. '...that costs less money' at $499. And, as noted already, not remotely in the same product category. Would you be reading an audio review site to determine the best photo retouch software for your iPad? Of course not. For the same reason you shouldn't be listening to what an Apple rumor site has to say about the sound of stereo equipment. You might as well as Gordon Ramsey which motor oil is the best for your car. Hoe your own row guys. Look for what real expects have to say before spending your money not this bunch of amateurs. Leave it to AI to bash anything that does not have the Apple logo. Fluance makes a pretty damn good product for the price. The HomePod is quite nice and sounds good for the size. Good for a bedroom. But, it just won’t cut it for a living room unless you live in a small apartment and that’s even if you have two HomePods and that gets you to $700. Comparing a device with dual 8" and 6.5" drivers to one that has a single 4" driver is just ridiculous. No amount of tech or power could ever bring that 4" device to the same level as the larger one. So really, what is your whole entire point? AppleInsider: "This product sounds better than, is more capable than, and is a better choice than the Apple product." CobraGuy: "LEAVE IT TO AI TO BASH ANYTHING THAT DOES NOT HAVE THE APPLE LOGO"
Uh... Everything okay over there? Feeling the bass is one thing, but the HomePod does have incredible bass for its size. I have a pair in my living room and they beautifully blend in with the furniture when not in use, but can turn it into a little dance studio when we crank them up. No extra source equipment, no privacy intruding Alexa, and good stereo separation. Apple Music is better and Airplay 2 means music can be synced throughout my house with the other 3 units (I know I splurged - they're cheaper ~$270 on eBay though). plus you have to add another $49-129 (or more) to get an "assistant" hooked up to it. Not too much into actually reading the review, are you. Why do people who don't know a thing about basic acoustics write articles about speakers and sound quality? Was referring to the comments, not the review of the product. Interesting to hear the difference, but not compelling because of how different the two products are. But what really surprises me is that you wrote this within a week of when iOS 12 ships and likely the next HomePod update as well. I hope you revisit this after those updates. My living room could be small in your standard but my stereo HomePod is great in this room. I have great sound. I have a real separated stereo channel. And I have a good privacy. I even have good, base filled room, speakers for watching movies on my Apple TV. Anyone are free to bet their futures with Alexa with all of their personal info but I will not. The Fluance seems like a fine product that is hideously fugly without a mask on, and impractically ginormous for most people/rooms. Its primary speaker strength comes when you crank it up so loud the police (and hearing-aid salespeople) will be paying you a visit. It is unable to have as much stereo separation as a pair of HomePods, and once you add $50-$100 to the price in order to gain "smart" abilities, the total price is roughly in the two-HomePod ballpark. It doesn't have Siri, but you can add Google's spyware or Amazon's spyware, which offers a more intelligent assistant at the cost of privacy and security. It's not portable, takes up a lot of room, dominates the room visually, and probably scares away anyone not totally into your taste in music. On the plus side, if you live far away from anyone else who would be annoyed by the volume, you can rock a hell of a party with this thing. Do I have that basically right?